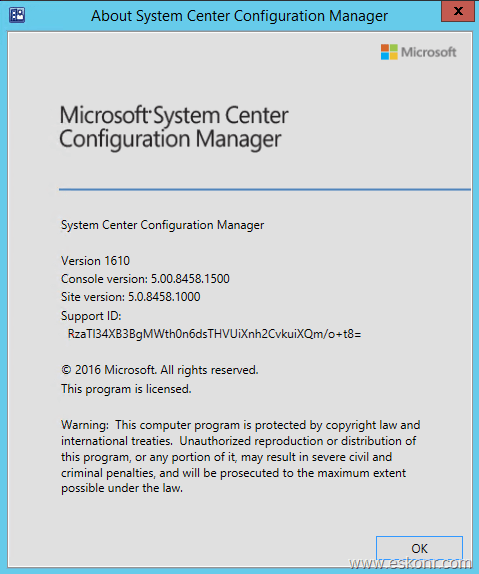 Microsoft released Update 1610 for SCCM Configmgr current branch (CB) that is available as an in-console update for previously installed sites that run version 1511, 1602, or 1606 which includes some great new features and product enhancements. This update (1610) includes lots of new features and enhancements in Windows 10 and Office 365 management, application management, end user experience, client management and also includes new functionality for customers using Configuration Manager in hybrid mode with Microsoft Intune. How to get this update available in your Configmgr Current branch ? As the update is rolled out globally in the coming weeks, it will be automatically downloaded and you will be notified when it is ready to install from the “Updates and Servicing” node in your Configuration Manager console. If you can’t wait to try these new features, this PowerShell script can be used to ensure that you are in the first wave of customers getting the update. By running this script on your central administration site or standalone primary site, you will see the update available in your console right away. Launch the console ,administration node—>updates and servicing—>Click check for updates. If you are not able to see the updates ,run the powershell script. Monitor dmpdownloader.log to know the status of update downloading. 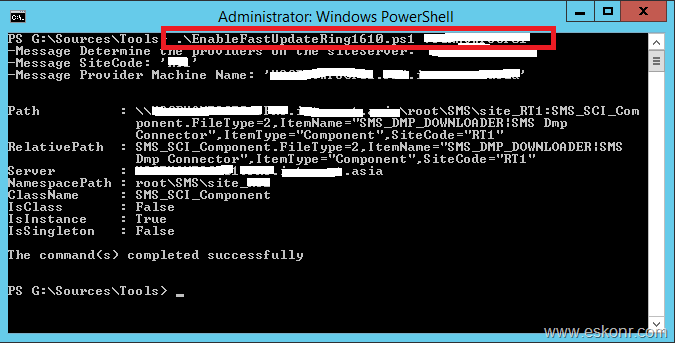 If the update installation is suspended at “Downloading” state for extended period of time, restart the SMS_EXECUTIVE (smsexec) service on the standalone primary or central administration site server (CAS). After a while you will see updates in the console. Once the download is ready ,state will be changed to available and ready for installation. Right click on the update and choose Install Update Pack ,choose next next next depends on the options you need. For installation status ,monitor CMUpdate.log . 10 Responses to "SCCM Configmgr Current Branch update 1610 available"
did you look at the monitoring node-->Updates and servicing status for installation status or ConfigMgrSetup.log in root drive (C:) ? Quick question, is it possible to roll back ConfigMgr Current Branch installation. For example, if I have issues with new CB 1610 version and would like to roll back, is there option to revert to previous version (1606) or that is not possible. btw,what issues do you have ? 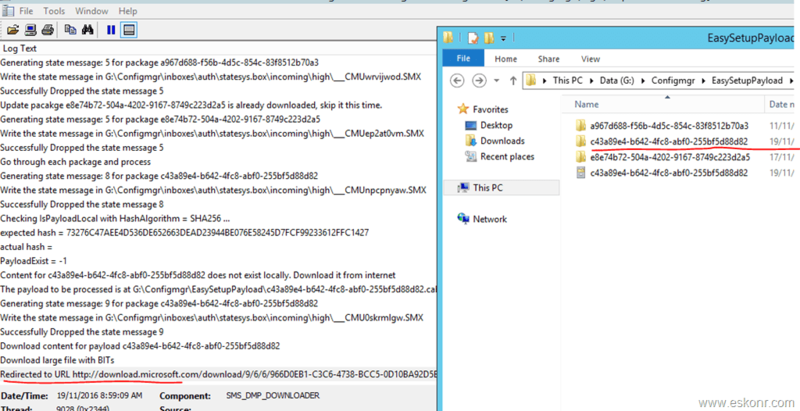 I am currently trying to update SCCM 1511 to 1610 (CB), however my updates are still in downloading state. I restarted the sms_executive service but it seems as if that did not work. Any thoughts? i would suggest to look at dmpdownloader.log to see the download progress also check if you have access to internet on the server. Hello, since I am now trying to install the update now I also noticed for the first time that the download was not working this never happened before. But after looking thru the dmpdownloader.log it was not able to extract the package af633310-e419-44b3-9e0e-ab93d57087cf.cab as it turns out that there is a autorun.inf which our antivirus was blocking. I would suggest disabling the AV while the extraction occurs. Ah ..that was quick fix and that was due to AV. Hi Eswar, thanks for this. I have a question - once you have run EnableFastUpdateRing1610.ps1 and then applied 1610, how do you turn it off again - to go back to slow ring? You dont need to turn it off or no such option exist to convert fast ring to slow ring. It will automatically set back to slow ring during the next update cycle. so you can simply ignore it.